If a certain old saying is true, I should never have to go to the doctor’s in the fall. I eat a lot of apples. Not only do I eat a lot of apples, I eat a lot of varieties of apples. How many? Well I decided to keep track of that here on the blog this season. See how many varieties I actually eat, right here on the blog. Plus I needed some place to direct my Instagram traffic to. If you are coming from Instagram, welcome, leave a comment. Tell me what brought you here. You might be wondering how in the world I find all these apples to try. I do a lot of active search for apples. I visit different orchards throughout the season. Farmer’s market are one of my number one sources. Grocery stores too. 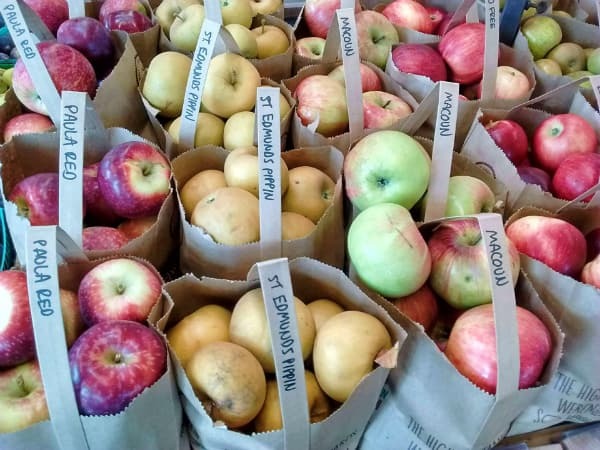 I am fortunate that my local Whole Foods Market gets apples in from an orchard that grows hundreds of varieties. They sell them for 99 cents a pound too, so it’s a fantastic deal. Something I think a lot of people do not know about apples is their flavor can change with age. For example, I tried a Swarr apple right when I first saw them. They were a bit too tart for my liking. After a week, they sweetened up more and had a good, almost pear like flavor. Or take a Paula Red apple. They are way too tart when first picked, but melllow out and get a lot sweeter after about a week or two. Unfortunately in their case, they get soft as that same point too – still make good applesauce though. Gala apples taste their best right off the tree. They are sweet and with good flavor. That flavor really mellows out the longer they are stored. I like to say the name of this apple like a pirate. Swarrrrrrrrrrrrr. Apples are not actually more similar to peaches than you think. Nearly all peaches you found in the grocery store are hard and need time to ripen to be good. Most people don’t want to bite into a crunchy. Sometimes apples need time to mature after picking to be at their peak. The different apples have is people do like them crunchy and they are easier to eat immediately. Finding when an apple is at peak of flavor only comes with experience and honestly a lot of luck. 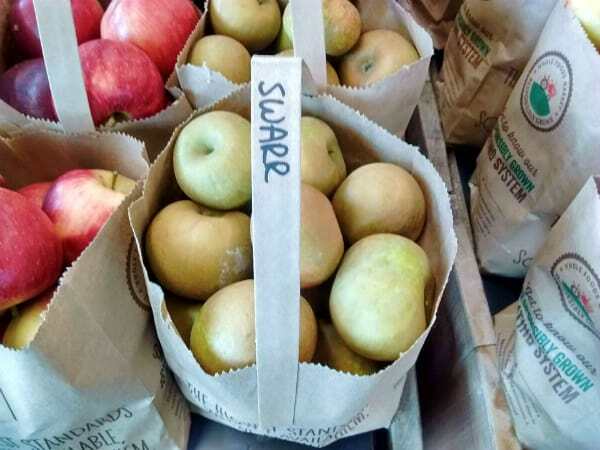 What makes it harder is that you can even see differences in a variety from orchard to orchard, particularly when those orchards are in different states or regions. 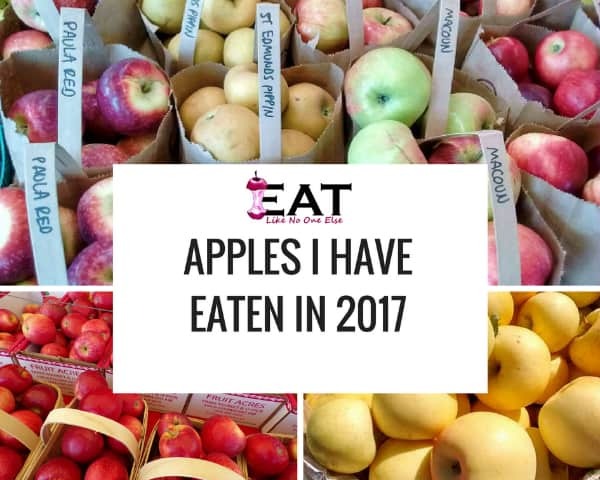 Here is the list of apples I have taken a bite of this season. If you have any questions about any of these varieties let me know. As we go down the list I will provide a few bites of knowledge to go with these apples. As the season progress so will the list. Had the best Gravensteins ever from Johnston Fruit Farm in Swanton, Ohio. Full of flavor, perfect sweet/tart balance. These apples are hard to pick for the perfect flavor. Even the bag I got of them had some great ones and some just ok ones. Choose these apples when they are fully yellow, with no green. A week after I bought these the flavor was outstanding. Best crab apple variety out there. Sweet with some tartness with a nutty flavor. Great small apple for kids. Tart early in the season, then 2 weeks in, they become too soft, but great applesauce choice. This apple won a taste test at my house with some friends. Newest variety from Stemilt Fruit growers. Crisp and juicy. Slightly more tart than sweet. Not bad, but nothing to really rave about. Fresh off the tree when perfectly ripe is the best. A very dense apple, Not very juicy. A sweet russett type apple that went soft pretty quickly. Had one too early in the season, had not developed enough flavor. Better picked later in September or early on in October. This book is a fantastic introduction to the world of heirloom apples. Tons of great photos. The kind of book you put on your coffee table with pride. Need some ideas on how to use up all those apples you picked at the u-pick? This book has got plenty of inspiration for ya. Hi Eric, I found your blog through the FoodBlogger Pro forum. I just ate a Fameuse apple (I think it’s also called a Snow Apple) from a friend’s very old tree. She says they’re normally not harvested until mid-October and when we looked them up, they used to be very popular but something wiped many of the trees out, and they were replaced by the McIntosh apple. Very interesting post and right up my alley. I’m looking forward to reading more of your blog! Thanks for coming to check out my blog. Yes, you are correct Fameuse is called the Snow apple for it’s snow white flesh. I have had this apple this year myself recently, got them at Whole Foods Market. Where did you find the swarr apples? Wholefoods? I’m trying to contact someone who grows them to see about their pollinator group. Not much info out there about this variety.